The demo company is the best way to learn how Xero works & to test an integration or add-on. If you have never used Xero before you should go through the Xero demo company guide in order to become familiar with some of the basic Xero features. Below is a rundown of the key differences between the demo company and a Xero trial organisation. To activate the demo company register or login to your Xero account and navigate to My Xero. 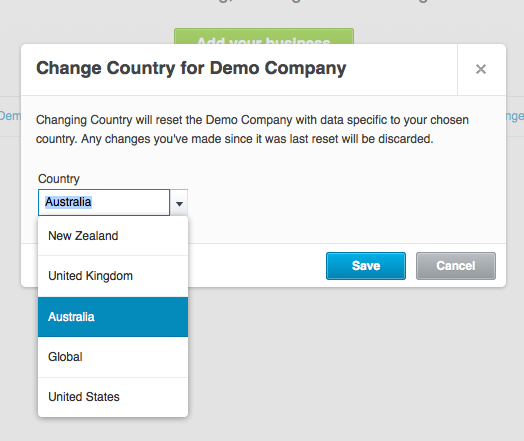 From the My Xero screen you can enter the demo company, reset the demo company & change the region of the demo company. The demo company can be reset at any time. To reset the demo company visit My Xero and click the reset button. From My Xero the country of a demo company can also be changed. Changing the country of the demo company will also result in the demo company being reset. Payroll is not enabled by default. When the demo company is created (or reset) you will need to enable payroll. Payroll is not available in all regions, you may need to change the country of the demo company in order to get access to payroll. To enable payroll simply navigate to the payroll screen and click "Get Started". The demo company can be connected to the API Previewer. Using the API Previewer and the demo company is a great way to learn how to use the API, debug & test. To connect the demo company to the API Previewer click here and select the demo company, if you would like to enable the Payroll API use this link. The process for connecting a demo company to an API application is the same as with any other Xero organisation. If you're using a Private application you will need to setup the application as per usual. When the demo company resets (after 28 days) you will need to create a new private application. If you're using a Public or Partner application you will need to setup the application as per usual and connect it to your demo company by going through the oAuth process. When the demo company resets (after 28 days) you will need to reconnect your add-on to the demo company.